Our LaMancha's are a joy to be around, and although a bit larger in stature than their 'room-mates" the Nigerian's...are very mild mannered, quiet and affectionate. 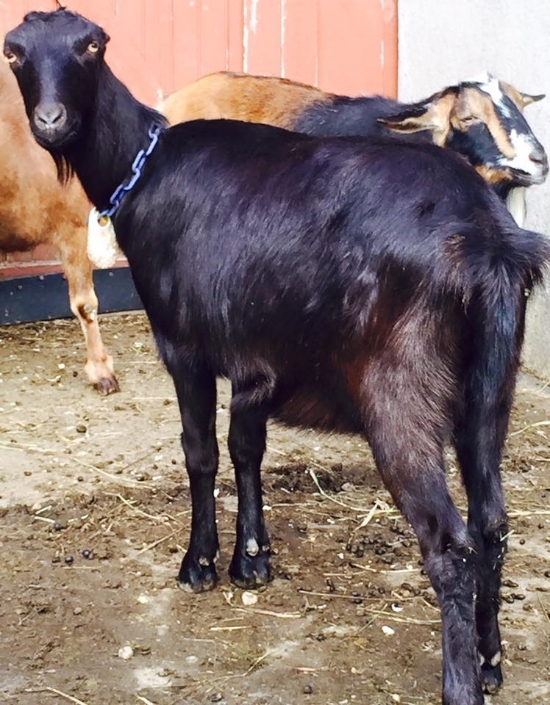 We find the LaMancha to be a very good addition to our farm and hope to cross them with our Nigerian bucks to produce offspring that are mid-sized milkers with wonderful temperments!This breed are thought to have descended from Spanish goats brought to California by early settlers. The distinguishing feature of this breed are it's small ears. Like the Nigerian Dwarf,the Lamancha has excellent dairy temperament. It is an all around sturdy goat that can withstand a great deal of hardship and still produce well. It is a dependable dairy goat producing quality milk with high butterfat and protein over a long period of time and can be milked for two years without being freshened. The Lamancha disposition is positive and loving, easy going and cooperative. Holly is one sweet girl, always waits patiently for everything and loves attention. She is the second of two does purchased from Three Bridges Farm and is filling all our expectations as she matures. Holly kidded with twin mini mancha bucklings in 2015 and buck doe twin Lamanchas in 2016 having been bred by Sunnydale Farm's Lynnhaven WAA French Martini. We retained her doeling "Victori". She has been an incredible milker putting a gallon and a half in the milk pail for us and really loves her job. Her sire Pine Baron has also excelled in the show ring and produces daughters that have long and flat bones with high and well attached mammaries.Looking forward to breeding her for 2017 Mini Mancha babies...stay tuned! Katniss is the much anticipated doeling kid from our sweet doe Blondie who has moved south to improve a herd of a friend. As a first freshener she freshened with a small but very productive well attached mammary system being easily milked and loving her job and has improved each freshening with more capacity. She LOVES being a milking doe and happily runs to the milk stand each day. I would like to see straighter feet but her positive attributes make up for her lack in that area. She is overly sweet and just a nice little addition to our farm. Misty is also a nice dairy doe with very good dairy character, open ribbing and loose dairy skin. Again, another nice doe from Three Bridges Lamancha's. Misty kidded in 2015 with an awesome mini mancha buckling (was hoping for a doe!) and twin blue eyed mini mancha doelings in 2016! She easily produces a gallon of rich , creamy milk each day and has nice pliable teats and easy to milk udder. we are more than thrilled with her! Misty will be re-bred to Felix for mini manchas in spring 2017! "Vicki" is such a nice little doeling and all I had hoped for from this pairing. She is very angular and dairy but her personality is her biggest quality! She is very willing to go anywhere I want to go and is just as sweet and calm as her mom. We look forward to breeding her in the future.